One of the most awe-inspiring of Lord Krishna’s forms is Sri Nrsimhadeva, His half-man, half-lion incarnation. 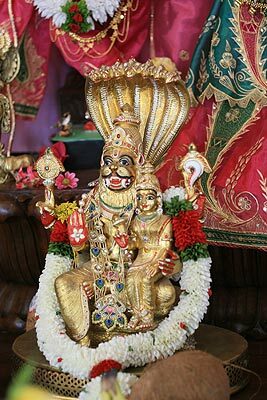 Lord Nrsimha descended to protect His devotee Sri Prahlada Maharaja from the atheistic king Hiranyakashipu, Prahlada’s father. Sri Prahlada Maharaja was a devotee of Lord Krishna from birth, having acquired knowledge of devotional service in the womb. Once, during the absence of Hiranyakashipu, his enemies the demigods, servants of the Supreme Lord responsible for universal management, kidnapped his wife to kill her embryo. They feared that the embryo might later develop into another terrible enemy. Srila Narada Muni rescued the mother and child after convincing the demigods that the boy to be born was an exalted devotee of Lord Krishna. While still in the womb during his mother’s stay at Narada Muni’s ashram, Prahlada overheard Narada’s transcendental discussions on the glories of the Lord and became fearless, fully surrendered to the infallible shelter of Lord Krishna. Later, though only a child of five years, he had firm faith in the Lord’s protection and invoked this same pure devotion to the Lord in the hearts of his schoolmates at the atheistic school of Sukracharya, the guru of the daityas, or atheistic descendents of Diti. Enraged at his son’s undeviating devotion to his worst enemy—Lord Vishnu, the four-handed form of Lord Krishna—Hiranyakashipu sentenced Prahlada to death. Hiranyakashipu’s henchmen tried everything to kill Prahlada. He was starved, poisoned, cursed by spells, beaten by fiends, stomped by elephants, encaged among virulent pythons, hurled from mountain peaks, and attacked with stones, fires, and blizzards. Despite all of Hiranyakashipu’s attempts, Prahlada remained untouched, and the evil king’s anger grew. Hiranyakashipu’s enmity toward Lord Vishnu had begun when the Lord in His form as a giant boar had slain Hiranyakashipu’s twin brother, Hiranyaksha, who had upset the earth’s equilibrium by greedily mining for gold. “As all surrender unto Me, I reward them accordingly. Everyone follows My path in all respects, O son of Pritha.” Thus the Lord appears as death for the atheist and as the loving savior for His devotee. And He Himself is beyond any material affinity. “This material nature, which is one of My energies, is working under My direction, O son of Kunti, producing all moving and nonmoving beings. Under its rule this manifestation is created and annihilated again and again.” The material energy, maya, is one of the many potencies of the Supreme Lord. Since maya is completely submissive to the Lord, there is no possibility of the Supreme Absolute Lord being overpowered by its influence. The living entities, however, being minute parts of the Lord, can be deluded. The Mayavada theory that after liberation the soul merges with God is refuted in the Bhagavad-gita (15.7, 2.12), where Krishna declares all jiva souls to be His parts eternally, remaining always distinct individuals. The Mayavadis also assert that the highest conception of God is of the transcendental, impersonal, and all-pervading nirguna-brahma (Absolute Truth devoid of quality, attribute, or form), which assumes a material conditioned body like ours whenever it descends to this world. Thus for the Mayavadis, Lord Vishnu or Lord Krishna are saguna-brahma, Brahman with attributes and form, which to them means material illusory entanglement, for they just cannot imagine transcendence with qualities and form. “Unintelligent men, who do not know Me perfectly, think that I, the Supreme Personality of Godhead, Krishna, was impersonal before and have now assumed this personality. Due to their small knowledge, they do not know My higher nature, which is imperishable and supreme.” (Bhagavad-gita 7.24) Thus from the Bhagavad-gita we learn that Lord Krishna never worked to achieve Godhood. He is eternally the Supreme Absolute Truth, and the individual souls are eternally His parts. Just as the Mayavadis maintain the false theory that by enough penance a soul can become God, Hiranyakashipu considered that he could achieve immortal dominance over all and vanquish Lord Vishnu with his own prowess. But Prahlada challenged his power. To hear that his strength was the grace of Vishnu, his worst enemy, was the greatest insult for Hiranyakashipu, who challenged Prahlada, “O most unfortunate Prahlada, you have always described an all-pervading supreme controller beyond me. If He is everywhere, then why is He not present before me in this pillar? If he does not appear from this pillar, then today your head will be severed with my sword.” With these words, Hiranyakashipu struck his fist at the pillar, from which emanated a sound that seemed to crack the covering of the universe. To prove true the statement of His devotee Prahlada, the Supreme Lord appeared from the pillar in a form never seen before, a form neither man nor lion, the form of Sri Nrsimhadeva. 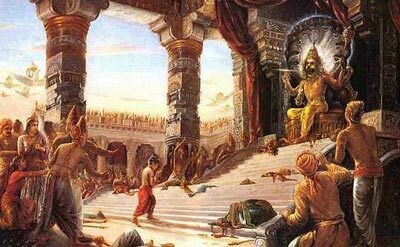 Though Hiranyakashipu looked like a moth entering a fire when he attacked Lord Nrsimha, he ridiculously thought he would be able to defeat the Lord just as he had conquered all his other enemies. Long before, when his brother had been slain, this same Hiranyakashipu had angrily rushed to the Lord’s residence with a trident. The Lord had then disappeared and entered Hiranyakashipu’s nostril. Unable to find the Him, Hiranyakashipu had considered that God was dead. Now Hiranyakashipu confronted the Lord, who played with him as a cat plays with a mouse. When the sun began to set, Lord Nrsimha lifted Hiranyakashipu onto His lap and dug His nails into Hiranyakashipu’s torso. Finally, Hiranyakashipu was not be killed by any living being created by Brahma or not created by Brahma. Hiranyakashipu was cautious to ensure that he would also not be killed by Lord Brahma, Lord Shiva, and Lord Vishnu, the three presiding deities of the universe (the only three living entities within the universe not created by Brahma). Lord Nrsimha is a lila-avatara, or pastime incarnation of Lord Krishna, and is not of the category of Brahma, Shiva, or Vishnu, who are the three guna-avataras, or deities in charge of the three modes of material nature. Hiranyakashipu, the universal tyrant, wished to reverse the system of piety. He wanted the impious to be rewarded and the pious to be punished. 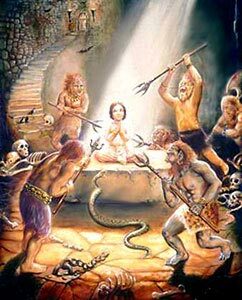 Thus upon the death of Hiranyakashipu, all the demigods and inhabitants of various planets offered their prayers to Lord Nrsimha, expressing their gratitude for the Lord’s slaying the daitya, who had usurped all their riches, wives, and shares of sacrificial offerings. 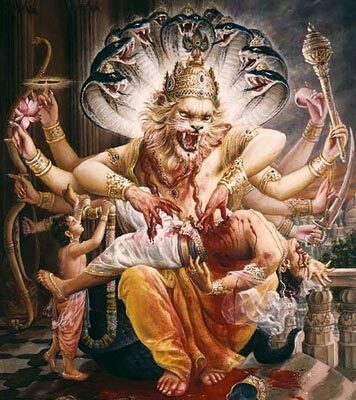 Only Prahlada Maharaja, however, could pacify with loving prayers the transcendental wrath of Lord Nrsimha, who is prepared to even appear as half-man, half-lion for the sake of His pure devotees. Lord Nrsimha was overjoyed upon beholding the firm faith of Prahlada, and He repeatedly requested him to ask for a boon. But the utmost compassionate Prahlada, who was more concerned for the welfare of others, only requested the Lord to liberate his demoniac father. The Supreme Lord guaranteed the liberation of twenty-one generations of Prahlada’s dynasty.